Once upon a time truck dealers dealt with trucks and you rarely saw a bus or coach on their premises but times have changed and many locations are now as adept at handling buses and coaches as they are at goods carrying vehicles. The Keltruck organisation has 14 dealerships spread across the Midlands, two of which, West Bromwich and Nottingham, are Regional Bus & Coach Centres within the Scania network, although the other 12 are also capable of providing assistance if required. The West Bromwich site is the company’s headquarters and it was here that I met Andrew Bentley, General Manager, Marketing & Business Development and Marketing Manager, Kris Benbow. They explained that work is undertaken on all sizes and makes of bus and coach. 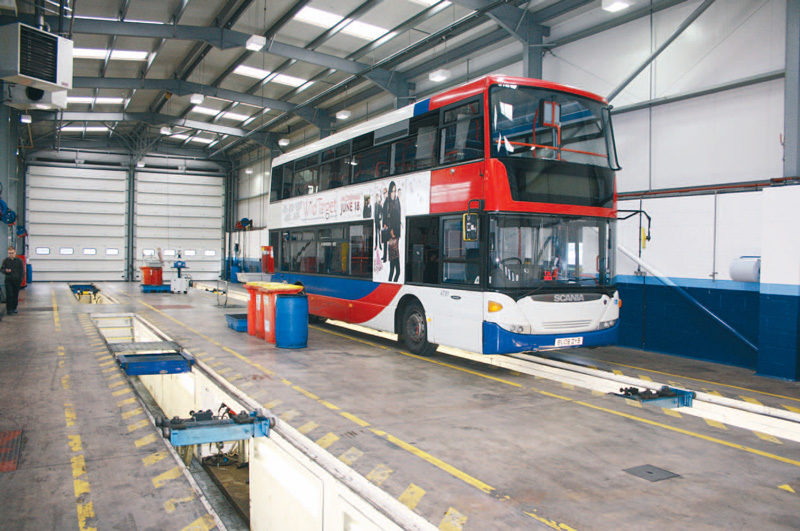 For example, an agreement to handle workshop overspill tasks for Dudley Council and Sandwell MBC, as well as tachograph work, regularly sees Optare Solo and Alero minibuses in the workshops. In the past, the site has dealt with a five year repair and maintenance contract on eleven new Scania OmniCity artics for what was then Travel West Midlands, and it later took on the maintenance of 38 Scania coaches operated by National Express on its own network before the diagrams and vehicles passed to Veolia, who handle their own maintenance. Rather than try and shunt articulated buses around, in 2005 two dedicated pit lanes were installed at a cost of around £150,000, and since that two fully equipped drive through bays have been added to meet the requirements of buses and coaches. Ongoing bus and coach work includes two year repair and maintenance contracts and warranty work on new vehicles for coach operators, all manner of painting work and an R&M contract with National Express West Midlands covering 60 K230UB4x2 OmniLink single deckers and five double deckers. ‘We can, and do, do anything that might need doing on a bus,’ said Andrew. ‘We’re quite happy to quote for the maintenance of a mixed fleet or even a fleet made up entirely of another make.’ As well as the maintenance side, all manner of body related jobs are handled including reconfiguring interior layouts. 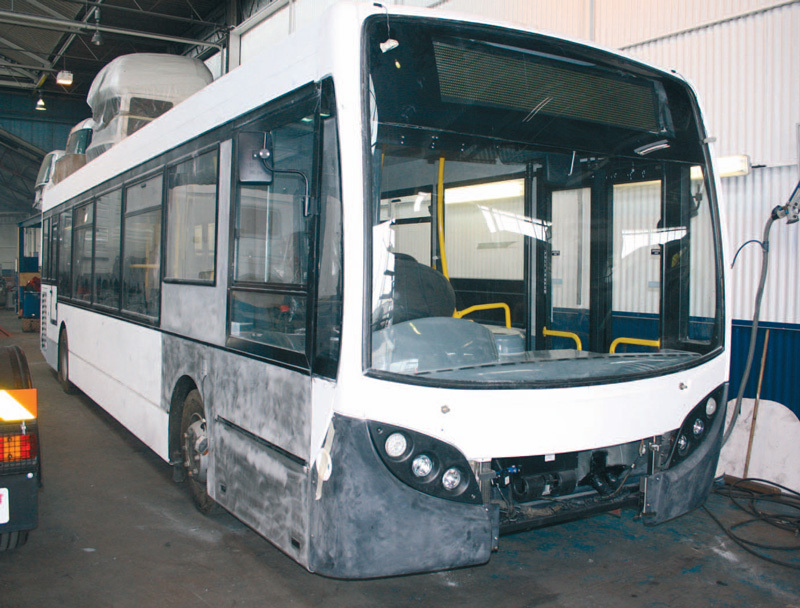 Rebuilt Enviro 200 What originally prompted me to contact Keltruck was a press release Andrew issued saying that work was almost complete on rebuilding an Alexander Dennis Enviro 200 10.8m bus after serious accident damage. 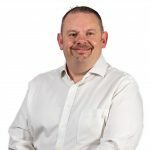 Chris Kelly, Chairman and founder of Keltruck, saw the extensively damaged 09-plate bus at an auction in February and bought it because he knew putting it right was a task within the capabilities of his workforce. It demonstrates the extent of the skills that can be employed on behalf of customers in the bus and coach industry, whatever make of vehicle they operate. Following a collision with a car, the Enviro 200 sustained extensive damage to the front offside that required replacing most of the structure (except the roof) from a point behind the offside front wheel to the A-pillar on the nearside. 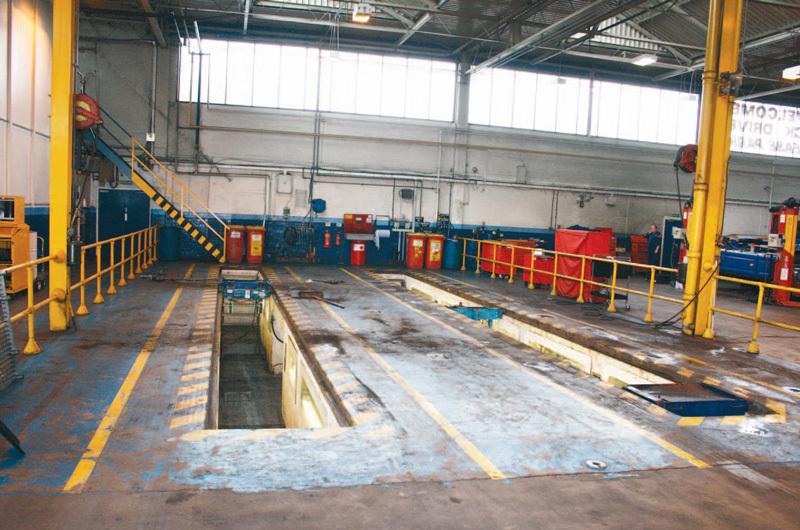 The chassis members needed straightening at the front, to achieve this and ensure the vehicle was returned to true Keltruck’s Josam chassis straightening equipment was utilised. 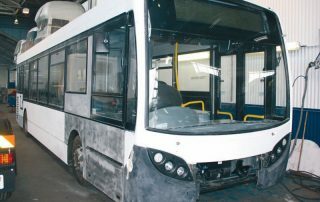 The necessary Keltruck replacement parts were sourced from Alexander Dennis and the project fitted in between other jobs. ‘We like the challenge’ said Workshop Manager, Paul ‘Toby’ Talbot whose son Boyd has completed most of the work on the Enviro. Paint facilities Once the last few jobs have been completed, and ADL have cleared the ECU, the Enviro will be offered for sale through the Used Sales department, managed by Phil Holmes. An option is for the new owner to have it painted in his livery in Keltruck’s paint facility. Two years ago the investment was made in a 60-foot long Dalby Spraybake oven with internal dividing door that can also enable two shorter vehicles to be painted at one time. The booth was specifically designed to be able to accommodate articulated buses. It has already been used by quite a number of bus and coach industry customers, among them BMC UK who have had schemes applied to several King Long coaches. One of the large bus groups has also made use of the booth for repainting buses. Graduated metallic schemes can also be handled. End of life centre A tour of the West Bromwich site, just off junction one of the M5, proved very interesting. Of particular note was the fact that, as well as selling new vehicles, the location is also an End of Life Centre for dismantling older vehicles. Trucks lead rather different lives to buses and coaches and will generally only have a working life of around eight years, so if a vehicle is damaged towards the end of that period it is often not economic to repair. 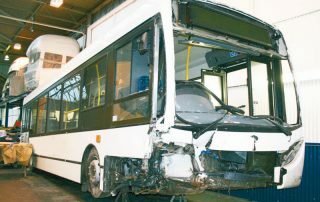 In the course of dismantling was a Scania tractor unit with an 04 plate that had suffered some frontal fire damage that had not reached the engine and driveline. This was being stripped down to its component parts so that what was salvageable could be either added to the used parts store or refurbished for further use. 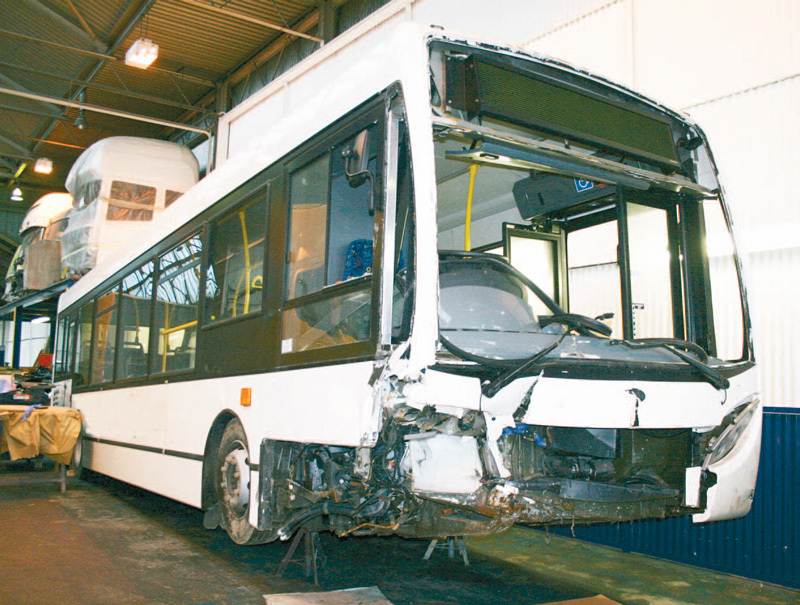 In the past, fire damaged buses have also been bought and stripped in the same way. Looking along the shelves Andrew showed me a variety of units including steering boxes which had been fully reconditioned, shrink wrapped and will be offered for further use at a cost below that of new parts, complete with a 12- month guarantee. Every one of the 20,000 parts reclaimed in this way is detailed on a computer system so that availability can be easily identified. The modular nature of Scania’s vehicle designs means that, in addition to the bus specific items, many truck parts are common with those on buses, so bus and coach operators might find this a useful way to locate the items they need. The company also offers Scania< insurance packages which are as relevant to bus and coach operations as they are to goods vehicle operators. Last word Scania’s full repair and maintenance contracts are proving popular with operators but Keltruck’s commitment to the bus and coach industry goes considerably beyond providing support for Scania, the brand with which it has been associated for the past 27 years. If you’d like more information contact Andrew Bentley at Keltruck on 0121 524 1808.